Leeds Teaching Hospitals NHS Trust is pledging to remove nearly all of its fax machines by 2019 amid increasing criticism over the NHS’s heavy reliance on outdated technology. Legacy fax machines and the privacy, security and patient safety issues they potentially represent are not just a problem in the UK, either. In the U.S., Centers for Medicare and Medicaid Services Administrator Seema Verma last month called on hospitals and other healthcare providers to strive to be fax-free in two years, meaning by 2020. And in Australia, Queensland Health is amid efforts to eradicate fax machines, though a recent development in which Ipswich Hospital mandated that clinicians use only fax machines for urgent referrals shows how tricky eliminating fax machines altogether will be. In the UK, Recent research released by the Royal College of Surgeons (RCS) found NHS hospitals trusts in England owned more than 8,000 fax machines, prompting calls to modernise the IT infrastructure of the health service as figures provided by the RCS indicated that only ten organisations included in the analysis did not own any of the outdated gadgets. At the time, Richard Kerr, RCS Council Member and Chair of the Commission on the Future of Surgery, said it was ‘farcical’ the NHS was investing in Artificial Intelligence and yet still using fax machines. Having already scrapped 20 of its 340 devices, Leeds Teaching Hospitals NHS Trust’s new campaign, dubbed Axe the Fax, has been launched to identify all the fax machines within its premises, their location, phone numbers and intended use before seeking to replace them with other processes. “The use of nhs.net is far more secure and safe than the use of faxes. We are aiming to help services safely decommission their faxes and move to email in the first instance and take it from there,” said Chief Digital and Information Officer Richard Corbridge, warning that the trust could not ‘afford to continue living in the dark ages’. A 2017 report on DeepMind Health released by a panel of Independent Reviewers noted that the NHS retained ‘the dubious title of being the world’s largest purchaser of fax machines’. "As a clinician the major concern I have with fax, is has it been sent to the right machine, been read by the right person, and appropriate actions have been taken. “That is why we are in the process of developing a modern auditable referral system that is embedded within our electronic health record,” said Andy Webster, Consultant in Emergency Medicine and Chief Clinical Information Officer. The trust has reportedly rolled out Managed Print Service (MPS) devices, with nearly 50,000 communications sent electronically during April and August this year ahead of plans to move to scan-to-email only, removing the fax option. 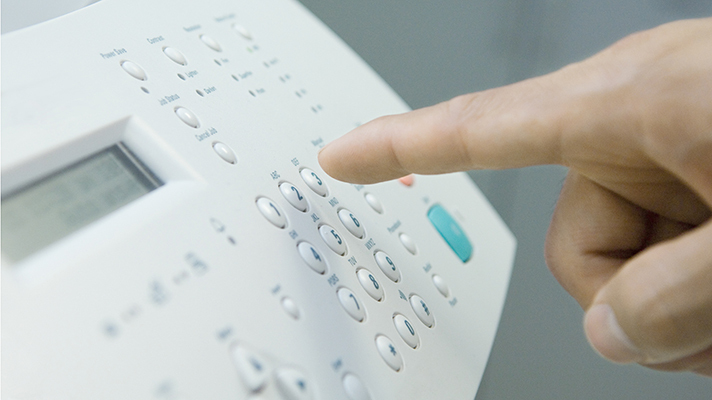 Meanwhile, new research released by Check Point last month, dubbed Faxploit, found that hackers could exploit vulnerabilities in fax machine communication protocols, and the only information required to carry out a cyber-attack was a fax number. While the analysis focused on HP devices, the researchers said they had “every reason to believe the same exploit can be applied to fax machines of other vendors.” Check Point researchers and HP worked closely to provide a patch to HP customers, already rolled out as an automatic update. This article originally appeared in Healthcare IT News sister site The British Journal of Healthcare Computing.